Description: This fun, grade 1 arrangement of the classic American song by Joseph Winner features everyone on the melody. Cello and Bass are doubled throughout, and Viola is always doubled with either 2nd Violin or Cello. 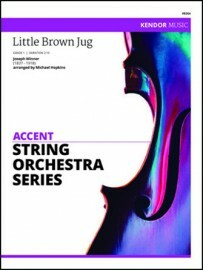 This is a great way to introduce fiddling and swing rhythms, circle bows with lift, and alternating pizzicato and arco. All parts are playable in first position in G major. Each set includes three copies of the 3rd Violin/Viola T.C. and piano parts. Duration 2:10.